The Early Edition doesn’t seem to be sure what it is. 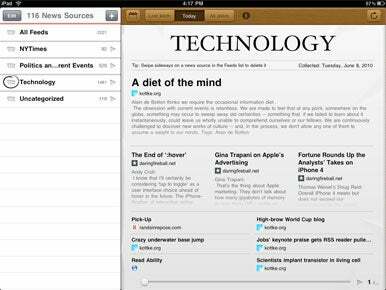 The $5 iPad app from Glasshouse aims to be part feed reader and part digital newspaper. But the end product is less than the sum of its parts. Think of The Early Edition as a feed reader dressed up in a newspaper form. The app has most of the features you would expect from a feed reader, including Google Reader syncing and the ability to organize feeds into sections. Tap on a feed or a section, and the articles will show up in a newspaper-like display. Controls at the top allow you to show the last articles fetched, today’s articles, or all unread articles. Tapping on an article brings it up allowing you to view it in the in-app browser, send it along to Instapaper or e-mail a link to the article. Today’s Top Story: The Early Edition lays out your feeds like a newspaper, with the most recent stories at the top of the page. So what’s the problem? Unless you only subscribe to a small number of feeds, The Early Edition isn’t a viable feed reader. There’s no Mark All As Read function, perhaps because the app wasn’t initially designed to handle all of your feed subscriptions, though recent updates seem to be pushing it toward become a full feed reader. The newspaper-like design is also an issue. The Early Edition displays a main article at the top, followed by several sub articles. Newspapers are laid out like this for a reason, though—in print, that main article is there because it’s the most important story. The Early Edition, though, sets a feed’s articles in these spots based not on importance but on timeliness—newer articles show up in the more prominent spots. Having less important stories presented like they’re the day’s top news doesn’t strike me as particularly helpful or logical. More to the point, laying out chronological feeds like a newspaper doesn’t allow for easy browsing. Instead of scanning down a list, you’re looking from box to box before turning the virtual news page for another batch of articles. It makes feed reading inefficient and unenjoyable. Reading articles is not as easy as it should be. The Early Edition’s article view is nice enough, but the text’s line height is a little short and the margins are too small, so reading longer content can be a bit of a pain. In addition, when you scroll the article, the text disappears underneath the article’s title, which I found jarring and distracting. The Early Edition efforts at realism struck me as over the top. Small elements, like the hand-drawn circles that designate a selected feed or section and the dog-eared page corner in the article view, serve no purpose. Application elements that resemble real-world things should do so for a reason, like fleshing out a metaphor for what the application is, but these elements don’t contribute anything. Instead, they’re more of a distraction from reading your feeds. The Early Edition needs to decide what kind of application it is. If it is a feed reader, then the newspaper metaphor is severely limiting and should be revamped. If, it is a digital newspaper—that is, an app that gives you the day’s important news—that requires some significant changes as well. Rather than just allow the user to enter feeds, the app may need to come with a great set of default news feeds, sorting them so the day’s biggest news gets prominent play. I feel like The Early Edition is in limbo at this stage. Its newspaper design makes for a poor daily feed reader, but its focus on feed reading holds it back from being something quite different—but potentially much more useful.